Eighteen Bridges Magazine of the year at the 2018 awards. Interview with Curtis Gillespie. Founder Curtis Gillespie answers some questions for AMPA about the success of Eighteen Bridges and how the magazine continues to captivate readers. What does it mean to be the recipient of this award? It means many things, but mostly it means that we can take some comfort in the fact that we are connecting great writers with wonderful readers. That’s really the only thing that matters in the end. Our singular goal is to give really smart and talented writers the opportunity to entertain and enlighten curious and smart readers. Any awards that result from that are just an acknowledgement that sometimes we get the mix right. What gap has the magazine filled in Canada’s magazine industry? Eighteen Bridges fills a gap in narrative long-form in print. There aren’t many mags that do it. We like to give writers room to express themselves, and we like print. And we like storytelling! The Walrus does it sometimes. Maclean’s does it sometimes. A few online mags do it. But Eighteen Bridges is the only mag in the country that sets out its stall to tell long stories…which may explain why we are still a relatively small publication! What makes Eighteen Bridges unique and who reads it? I honestly don’t know that I could say who our readers are. We don’t do surveys or anything like that. I am wary of information overkill. I also feel that we (meaning, editors and mags in general) should be careful of falling into the trap of “giving our readers what they want.” I see our job as supplying our readers with great stories, but beyond that I don’t know that we have a mandate to fulfill. My ad sales people would probably kill me for saying this, but I place more importance on hearing what stories talented writers want to tell than on what readers want to read. My belief is that a talented and passionate writer will win over a reader, no matter what the subject matter is. See above! To be serious, though, we focus very much on narrative, on making sure we entertain our readers, on choosing topics that can be relatable, on focusing on people rather than abstractions. It’s not a super complicated recipe. How has keeping with the tradition of narrative journalism helped the magazine’s success? Our belief is that any subject matter, literally, can be related to a general audience when using narrative as the platform for delivery. The best example of this is The New Yorker, which has stories ranging from pop music to geophysics to celebrity culture to horticulture. You name it, they write about it, but they always do it through narrative. That’s why it works and that’s why the “general audience reader” enjoys it; not because they are necessarily into horticulture, but because everybody loves a good story. What’s the origin of Eighteen Bridges? Basically, it was Lynn Coady and myself bemoaning the loss of Saturday Night magazine and deciding to do a magazine of our own. We dreamed it up out of nothing and to this day I’m still sometimes amazed it even exists. Lynn moved on to much lesser things (Giller Prize and writing her own TV shows, yawn), but she still helps out with ideas and connections when she can. How are you associated with the Canadian Literature Centre at the U of A? The CLC is our home base at the University of Alberta; they are hugely supportive and offer great admin support. How has your recent collaboration with Edmonton Community Foundation (ECF) and Litfest helped build Eighteen Bridges? The ECF/Litfest collaboration was an experiment that paid off in incredibly wonderful ways. They were great to work with, especially ECF, in that both 18B and Litfest were essentially creating things under the umbrella of the ECF. It allowed us to do something that had a wider reach, and it seems to have paid off. What has been the greatest challenge so far and what do you anticipate to be future challenges? What’s the magazine’s greatest accomplishment? Becoming a home that great writers trust and great readers enjoy. What’s next for Eighteen Bridges? 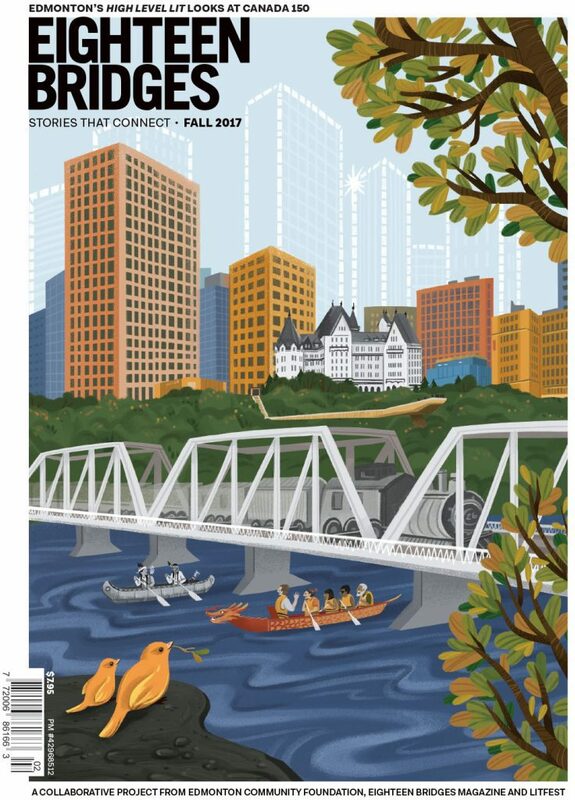 Read Eighteen Bridges’ award-winning articles in the Alberta Story, Feature Writing Short and Fiction awards categories. All Alberta Magazine Awards winners and finalists can be viewed on the conference and awards site.